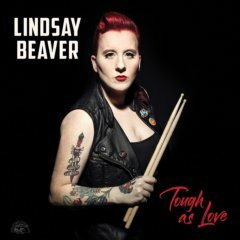 A uniquely talented musical spitfire, Lindsay is a jazz-trained drummer and a classically-trained vocalist, writing and performing raw R&B, blues and old-school rock ‘n’ roll songs with punk rock fervor. Tough As Love explodes with Beaver’s volcanic singing, deeply soulful delivery and powerful chops on seven original songs and a handful of vintage roots gems. A refreshing slap across the face of roots music. Lindsay would like to thank: My mom and dad, Laurie and Brian Beaver, Annie Frosst, Brad Stivers, Josh Williams, Laura Chavez, Reo Casey, Eve Monsees, Dennis Gruenling, Sax Gordon, Matt Farrell, Marcia Ball, Jimmie Vaughan, Robin Vaughan, Lisa Pancratz, Bruce Iglauer, Mike Keller, Scott Nelson, Cesar Crespo, Leslie Hagins, Zach Ernst and all the staff at Antone’s, John Scholes, Doug Cox, Cam Hayden, Holger Peterson, Rosy Rosenblatt, Gary Pott and Morrow Scott-Brown. To all those who contributed to the crowd funding for the demo, a BIG thank you: Tom Hyslop, Dave Brennan, Brian Carpy, PJ Bell, Michael Gasser, Colin Cameron, John Scott, Lena Kim, Dave Sampson, Ian Campbell, Steve Kolar, Rhys Williams, Lori Portnoy, Ward Wylie, Ian Royce, Rod Peterson and Alan Moulding. The blues and its musical children—R&B, soul and rock ‘n’ roll—have become a true international language. In spite of that, I never expected to choose a female singing drummer from Halifax, Nova Scotia in easternmost Canada to be the newest member of the Alligator Records family. But when I heard Lindsay Beaver, I knew she was a talent that just couldn’t be denied. Lindsay delivers blues, R&B and old school rock ‘n’ roll in a voice brimming with attitude and soulfulness. She’s described her music as “punk blues” but that’s too narrow a term. She comes at every song with urgent intensity, soul-baring emotion, a distinct swagger and a take-no-prisoners confidence. And she does so while standing (not sitting) behind her drum kit, driving each tune with her tough, less-is-more playing. With the encouragement of her drum teacher, Lindsay applied to music school in Toronto to study jazz drumming. “I barely got in. All I could do was shuffle really well. I wasn’t good enough for a scholarship; I’d only been playing for a year when I applied.” While studying drumming she played and sang in local bands, but quickly realized she had her own musical statement to make. At the age of 24, she founded the 24th Street Wailers, leading the band from behind the drum kit and singing her own originals as well as carefully-chosen covers. She explains, “When I first started out with the band, I couldn’t find a singer I liked and I couldn’t find a drummer I liked, so I decided to do both.” She and the band began making a name for themselves in Toronto and across Canada. Over the course of the next few years, the band cut five albums, three produced by Lindsay, even winning a nomination for a Juno Award (the Canadian Grammy). Soon she attracted the attention of Texas guitar legend Jimmie Vaughan. “I opened for him in a small town in Ontario. He really dug the band and we got to be friends. After that, when he would come to Canada he’d invite us to his shows. He told me about how much I’d like the Austin music scene and I came down to check it out and kept coming back.” She began sitting in around town, and finally moved to Austin in 2018. She’s definitely established her reputation there, as witnessed by the terrific Austin musicians who chose to appear on the album, including fiery guitarist Brad Stivers and rock-solid bassman Josh Williams (both now in her touring band), plus pianists Marcia Ball and Matt Farrell and guitar ace Eve Monsees. Lindsay Beaver has already played across the U.S. and Canada and toured Europe multiple times. Now she’s ready for the next giant step in her career–her first album under her own name. It’s proof that no matter where she comes from and how unlikely her story, she can deliver a song with so much honesty, passion and soul that her impact is undeniable. I think that’s the most extensive set of notes I’ve seen from Alligator, but my mind is almost gone, so maybe not. She sure packs a wallop, doesn’t she?! Good gracious! And she’s good!